Ferry? – Where is the entrance? None of the 5 submissions pay attention to the ‘entrance’, or ‘entrances’. The Bay Street entrance should be ‘iconic’, to be highly visible when walking south on Bay Street, or along Queens Quay. Whereas in the past, strangers at Bay and Queens Quay would ask ‘where is ferry?’, it should, with any changes, become very obvious, and iconic. The Bay Street entrance should embrace the full width between buildings, and utilize park access on both sides of the private driveway, perhaps with signage across the existing private pedestrian bridge. The driveway itself could be narrowed as it meets Queens Quay, widening the public path on both sides. Various submissions include other public entrances, namely York Street, and Yonge Street (west side of Yonge slip). This is excellent. One submission has a bridge across the Yonge slip facilitating access from the east side of the slip also. Excellent. This connects then to the promenade going east. Entrances other than Bay should by design be subordinate but related to Bay. Thus giving the Ferry and Park a much stronger presence. KPMB plan utilizing second public recreational level over ferry related space is also excellent, and very attractive. The wavy woodwork is the statement visible from the water, and it might well be the necessary iconic theme carried over to all the entrances. On a secondary level, some nautical flavor might be added. The size of the pool/skating area might be reduced by moving the northern boundary south, so as to enlarge (widen) the connection to the York entrance. The ferry is used mostly in summer and summer weekends, when throngs of visitors, with kids, strollers, carts, bbqs, coolers, and more, trudge down Bay Street, negotiate very dangerous traffic at Lakeshore Blvd, then queue for an hour, all on their way for a day out on the ‘islands’. What else can be done for their comfort and safety? Consider closing Queens Quay to through traffic on summer weekends, to reduce traffic and enhance safety for the thousands. Do it by forcing QQ westbound traffic up Yonge and eastbound up York. Access to addresses between Yonge and York can be made via Yonge, Bay and York. While rebuilding the park sounds fun and improves the waterfront, the construction disruption must be taken into account now. 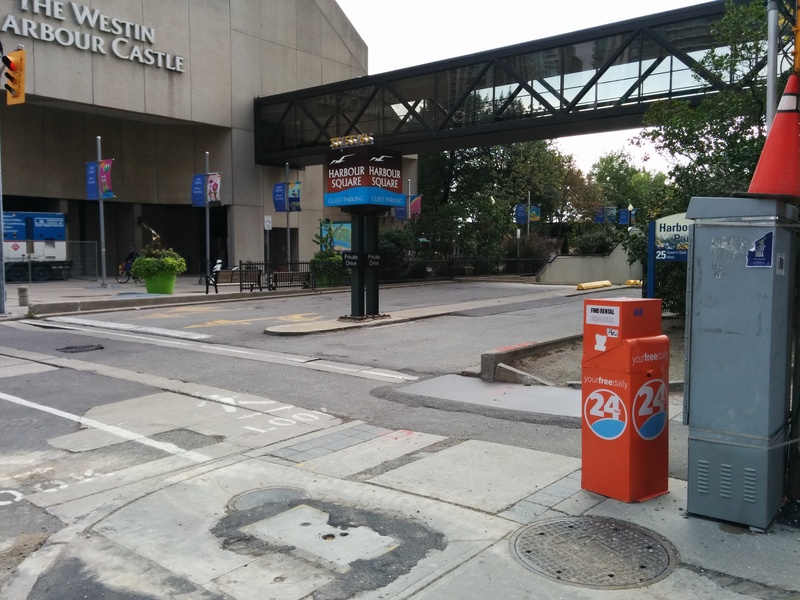 Queens Quay re-do has been and still is an ‘iconic’ mess. Every target imaginable has been missed. It is grossly unacceptable and we need much better. Assess your abilities now and if you cannot do much better, then don’t do it – what we have is better than years of mess. At the very least construction should be limited to non summer periods, and if running into more than one winter, be divided into distinct phases, perhaps with distinct contracts for each winter period, with absolutely no construction or construction mess for the summer.